Product prices and availability are accurate as of 2019-04-17 02:44:22 EDT and are subject to change. Any price and availability information displayed on http://www.amazon.com/ at the time of purchase will apply to the purchase of this product. These are all Clear Ball Mason Pint Jars. We use galvanized lids and vintage style cloth covered cords, giving it the vintage look. Not the 2 piece lids and plastic coated cords seen on many of the chandeliers. All jar lights have their own on/off switch so that you can adjust the amount of light that you have at any time. Comes with 5 clear pint mason jars, a 5" chrome finished canopy (ceiling mount) and all hardware needed for installation. These light sockets are an E26 Medium socket (standard size), but the jars do get hot if using a regular light bulb. 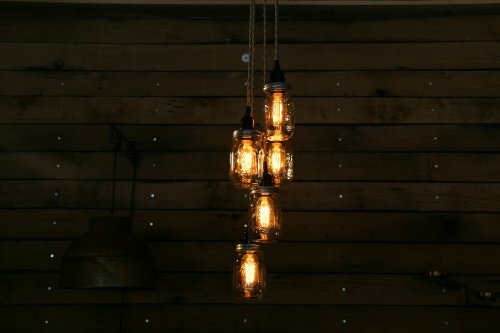 So we use CFL light bulbs or Edison style bulbs, either one will almost eliminate the heat on the jars. Light bulbs are not included. The cords are reproduction Sand colored Vintage style cloth covered cord which adds to the time line of the mason jars. This cluster of jars will hang down approximately 3 feet at the lowest point. 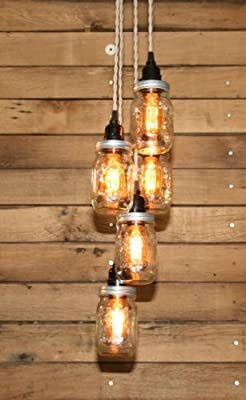 This will come with instructions on how to adjust the lights to the staggered or clustered look that you desire. **The socket is a standard socket and will take a regular medium size base (E-26 normal household socket size). These will NOT take a regular household bulb. They are too wide and put out too much heat. 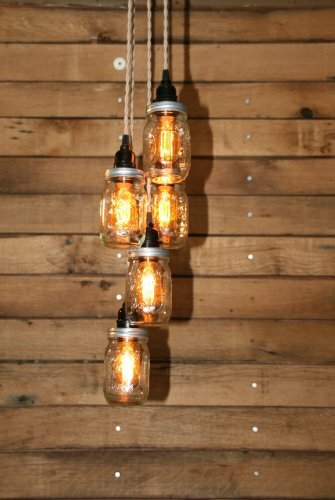 So we suggest an Edison Style Bulb, a CFL or decorative bulb no larger than 2-1/4" wide. The CFL light bulbs will almost eliminate the heat on the jars. Light bulbs are not included. If you would rather a LARGE MOUTH lid on these (the large mouth lids/jars will take a regular household bulb), please email us immediately after your purchase. ///// ** We take great care in building our light fixtures, paying close attention to detail and using UL Recognized Components, however, as a whole fixture, it is not UL listed.